Santa Monica Press, 9781595800855, 264pp. As adults, we have more responsibilities than we could have ever imagined growing up. Learning the work of marriage. Navigating the bumpy terrain of parenting. Maintaining social relationships. Facing grave hardship. Finding contentment in our career. As the years pass by, we sense how the good things in life are so often eclipsed by stress. We find ourselves doing everything we can just to endure adulthood, all the while wondering whether we are actually enjoying it. 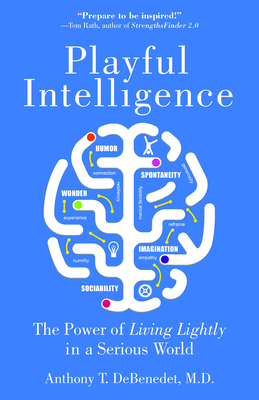 This is exactly why Dr. Anthony T. DeBenedet decided to write Playful Intelligence: The Power of Living Lightly in a Serious World, to show readers how playfulness helps us counterbalance the seriousness of adulthood. "Five years ago, my life was becoming more intense and stressful," DeBenedet says. "My relationships, clinical work as a physician, and basic interactions with the world were blurring into a frazzled mosaic. Going through the motions became my norm, and every day brought busyness and exhaustion. I thought about whether I was depressed. I didn't think I was. Anxious? Sure, but aren't we all anxious on some level? I also thought about the lifestyle factors that could be making me feel this way. Was I getting enough sleep? Was I exercising regularly? Was I eating healthy? Was I playing and remembering to be playful?" Today, we live in a taxing world. The endless pressure to keep up with our responsibilities and the daily headlines swarming around us can be overwhelming. DeBenedet's work comes at a time when stress, uncertainty, and intensity levels are high. Playful Intelligence shows adults that there is a way to live lighter--and smarter--as we navigate the seriousness of adulthood. It's not about taking life less seriously; it's about taking ourselves less seriously. The book's core chapters are devoted to exploring the effects and benefits of five playful qualities: imagination, sociability, humor, spontaneity, and wonder. By examining playfulness as a sum of its parts, readers will gain a working awareness of its power and be able to apply playful principles to their own lives, bringing the magic of childhood back into their day-to-day existence. The book also offers practical suggestions on how to make life more playful in nature. Anthony T. DeBenedet, M.D. is a practicing physician and behavioral-science enthusiast. His interviews and writings have run in various media outlets, including the New York Times, the Today show, the Washington Post, and TIME Ideas. He also co-authored The Art of Roughhousing: Good Old-Fashioned Horseplay and Why Every Kid Needs It (Quirk Books, 2011), a parenting book about the importance of parent-child physical play. DeBenedet has a Bachelor of Science Degree in Biomedical Engineering from the Duke University Pratt School of Engineering, a Master of Science Degree in Health and Healthcare Research from the University of Michigan Rackham Graduate School, and a Doctor of Medicine Degree from the University of Virginia School of Medicine. He completed his internal medicine residency and gastroenterology fellowship at the University of Michigan Health System. DeBenedet lives in Ann Arbor, Michigan, where he enjoys spending time with his family, connecting with friends, and playing a little basketball.